I pray for a personal word for each new year, usually in December or early January; but with the shmita year (sabbatical year) having started this past September at Rosh HaShanah on the Jewish calendar, I chose my new word much earlier, and have been living with it in mind for a handful of months. My word of the year is: release. The shmita year is a release and restoration season, in general, so I have been intentionally following the refreshing winds of change in the Spirit that I began feeling in September. So much has been happening spiritually and physically that I haven’t (and don’t) have time to record. With the “double new year” this January, I have been so excited for the new things God is doing. Funny enough, our whole family came down with walking pneumonia in the last days of December (we are now recovered), so this first month of the year has been for resting, developing strategy, and seeking God’s wisdom rather than the jumping into new things that we expected. I have been reminded to release my expectations to God, even as I release myself into His freedom. I have also been purposefully releasing things of the past (both the hurtful memories and expectations of the past, and the good things that have prevented me from necessary change). I feel like this is a time to press into the Lord for spiritual understanding of what He is restoring in our lives this year, and how we can partner with Him to receive those blessings. A few days ago I began to pray for strategy and insight regarding one of my chronic health conditions, and received an amazing encouraging dream answering my questions, and giving me the endurance to continue trusting God with this area of my health. God wants to talk to us, to encourage us, and to help us to submit our lives to Him completely. This is a great time to pray about the new year and any desires, resolutions, or unanswered prayers you might have, and to watch and listen expectantly for the Lord to reveal supernatural understanding into how His Spirit is moving in your life, and how you should respond. 2 Peter 1:3-8 is one of my very favorite passages because it tells us that we have everything we need for life and godliness through our Lord Jesus Christ; but also that we are not expected to be mature in “everything” all at once, because there is a progression of building character and virtue. This is wonderful news for all of us, and especially for those who are parents in some capacity (parents, grandparents, mentors, etc.). Through the Holy Spirit we have full access to all the resources to win at life. And if and when we feel like we are failing, we can remind ourselves that if we are dependent on Him, then indeed we are not failing after all, but rather slowly building our character in partnership with one proficient in all our weaknesses. After reading and commentating briefly on this passage at the shower (I prefer not to work from an outline, so it is a mystery what I said exactly ;-)), I passed around a bag of mixed wild flower seeds, inviting everyone to take as many as they liked. The seeds are small and don’t look like much, but when they are planted in the right environment, they grow into beautiful flowers. The miracle of God’s Creation is that within each seed God has placed everything necessary for the seed to grow into its preordained plant. The nurturing of the seed is important, but nothing needs to be added to the seed itself. It will grow, or it will not grow; but the growth that occurs will be in line with God’s design as wrapped up in the nature of the seed. There are “seeds” of all different sorts of things: seeds of spiritual gifts, and jobs, and missions… and within these, a “parent seed.” When God calls us to be parents, we are not alone in a mess of figuring out what to do with little people–though maybe it feels like that sometimes. In fact, to those who are parents, God has given not just the gift of life, but the ability and privilege to blossom as a parent through Him. Each parent, when partnered with the Holy Spirit has the right personality and resources to parent the particular blessings He has given us. If you are a parent, no one can raise your kids better than you. You are the right one for the job. And regardless of how many times you may feel that you are not up to par, the Lord is with you to give you the wisdom and endurance you need to be successful. In difficult moments, pause, pray, and remember Peter’s wisdom: you have everything you need for life and godliness through our Lord, and as you continue to seek Him and His ways, your character is being strengthened so that you can withstand the obstacles and temptations, and be fruitful in this calling. The parents who plant themselves in God produce godly fruit–and if you are a parent, this includes you! We can trust God with our children; and with our parenting. Rene Gutteridge is among my favorite authors, so I could not pass up her novelization of Rik Swartzwelder’s screenplay. The movie version will be released February 13, 2015, just in time for Valentine’s Day. The players are Clay: a former frat boy, now “old fashioned” Christian, who is uncomfortable even being in the same room alone with a woman; and Amber: a free-spirit who moves around a lot, and enjoys adventure. They enter into a humorous courtship, emphasized by the differences in their personalities. There is also a more serious side as they deal with their past pains. The narrative is cute, romantic, and funny. There is not much more to it. I think some of the themes could have been better developed–especially in dealing with their past issues. And the content toward the end felt a bit rushed to me. I am not actually an advocate of “courting” in general as I think it tends to rush relationships toward marriage prematurely, so this bias probably aids in my not loving the book or the ending. Nevertheless, I enjoyed it for what it was (a light, quick read), and think it has the potential to be a great conversation starter in a book club, or a feel-good romance for those who want something appropriate and fun. Abigail Foster is practical, intelligent, and worried she may end up a spinster when the man she has admired since their childhood seems to have eyes for her younger, prettier sister instead. When a bad investment forces her family to look for a more affordable living arrangement, an interesting opportunity arises for them to rent Pembrooke Park. The manor has been abandoned for many years, and is rumored to be haunted and to hold treasure in a secret room. The narrative twists and turns through mysterious happenings and suspense, love triangles, strange neighbors, long lost family members, formal parties, hidden secrets, and a very real treasure. 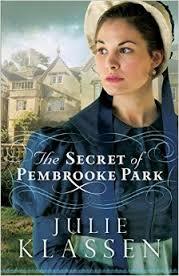 The story and characters are so engaging, I hardly noticed the 450 page length as I read through it quickly. There is a direct faith based message, which I felt was slightly awkward toward the end as Abigail seemed to jump from non-practicing Christian to preaching Christian without enough spiritual build-up. Even so, the message is a good one. It’s not overdone, but could just use a better transition, and the strength of the overall narrative makes up for it. The complex mystery is fun to read, especially as it becomes a meaningful illustration of faith and God’s love. This is one of the most moving biographical testimonies I have read! 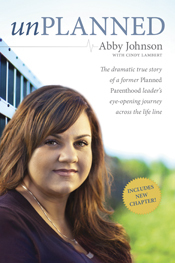 Abby Johnson’s passion for helping women prompted her to volunteer with Planned Parenthood, where she eventually became the director of a clinic in Bryan, Texas, counseling and aiding hurting women–and yes, aiding in abortions as well. She even had a couple abortions herself. It is an exciting miracle, then, when God progressively transforms her heart to recognize the harm and injustice of abortion, despite her good intentions, and to confront the lies she had believed about abortion being a helpful and viable option when God has better plans to make all things good–even in the most difficult situations. 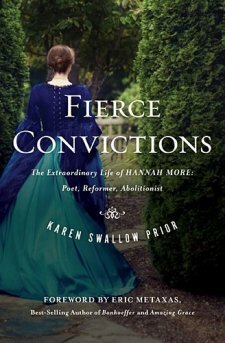 Her testimony is powerful, vivid, and emotional; sharing honestly from both sides of the pro-choice/pro-life conflict. This is a difficult topic, but I felt the story was balanced in revealing the good and the bad from both sides of the “fence” (e.g. the pro-choice love for women that may be unexpected from a pro-lifer, or some of the hate-filled methods of protest by the pro-life crowd). In eventually partnering with the “enemy” (the Coalition for Life), Abby finds God’s love, and begins partnering for social justice in God’s way. It is truly a remarkable story; and the new ending in this revised version is exciting for the pro-life camp! I received a complimentary copy of this book from Tyndale House Publishers (it is co-published with Focus on the Family). 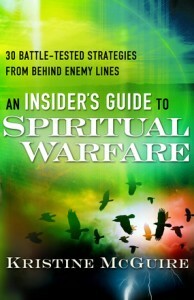 This devotional guide to spiritual warfare is engaging and approachable. Separated into 30 short chapters, Kristine McGuire shares openly and candidly from her apostate experience as a practicing witch. Now a born-again believer, she outlines the basics of the spiritual battle, the armor of God from Ephesians 6, several of the most common battlefields (e.g. suffering, fear, and anger), and how to relate to God and the supernatural within our identity in Him. McGuire writes in the style of oral language, which makes the grammar a bit “creative” at times, and I admit to having been slightly distracted by this. However, her sweet and honest tone make her words come to life as if she were presenting live to a friend, and some readers may even find this style more engaging and relatable. Having experienced the occult myself, I also think she could have gone into more detail regarding the nature of the spiritual battle as it overlaps with the physical realm–but maybe this would be better in another separate book. Finally, the reflection questions at the end of each chapter are particularly good, and would make an excellent outline for a discussion based study group.